Glory QuickChange - Technology Unlimited, Inc.Technology Unlimited, Inc.
eliminate up to 400 hours per year of non-customer facing labor, enhance customer engagement, and increase core deposits. As a destination service, QuickChange also offers the potential for fee income. The overall QuickChange design and staff-friendly features that promote continuous processing ensures your customers and staff will embrace this new service. 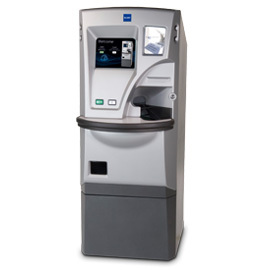 QuickChange has easily viewed status lights located on each side of the front facade which alert branch staff to the machine’s status to ensure the solution is always available for client use.